Tomorrow morning Ruth and I will get up at 3:30 AM and be glued to the television set when coverage of the wedding of Britain's Prince Harry to American actress Meghan Markle begins at 4:00. Ruth has created her own fascinator headgear and I've been practicing "God Save the Queen. I must say I'm sounding quite impressive. This is, as you might suspect, a total fabrication. Well, Ruth may get up in time for the nuptials at 7:00 but there will be no fancy hats or stirring tributes to her Royal Majesty. Harry and Meghan seem like a lovely couple and his work with the Invictus Games is heartwarming. But he's not only a "spare to the throne," he's something like sixth in line, so he'll never not-really-rule Britannia. Little wonder that even 70% of Britons don't really care about the wedding. I do find it intriguing that they have chosen Michael Curry, the presiding American Episcopalian bishop, to offer the homily at the wedding, even though the Archbishop of Canterbury Justin Welby will preside. This is a first for a foreigner to preach at a royal wedding and Curry is a person of colour as well. He is reputed to be a fine preacher, although weddings aren't really an ideal opportunity for letting loose with the gospel. Perhaps his choice is as much symbolic of the spirit of change that Meghan and Harry are embracing and represent. The monarchy is a curious and fading institution, so why not offer a more refreshing face to the world? Are you a closet monarchist? Will you be up early to watch the wedding? Does it matter if there is a message to a couple as they marry, or is it all for show anyway? 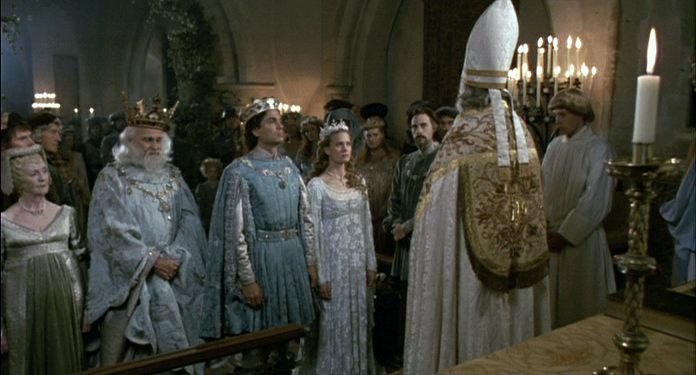 Oh yes, do you remember the wedding from The Princess Bride? guilty! Was up early, and really enjoyed the whole thing. The sermon was fiery, and might have caught a stuffy lot off-guard. As a young man, I didn't care much for all this, but as I age, I do appreciate special events more, especially in a world that seems to thrive on bad news. The Queen and Philip are pretty impressive considering their age. .....besides, what else could you do on a Saturday morning? Of course I watched it ... I loved the space (all that history!) and loved the ceremony with its mixture of traditional British and refreshing African - American gospel influences (That sermon needed to be heard!). The music was fantastic and meaningful. SO glad the couple did it their way, with respect to both of their traditions and backgrounds - it was truly their day ... a good beginning, I would say ! And the dress reflected Meaghan' elegant simplicity.